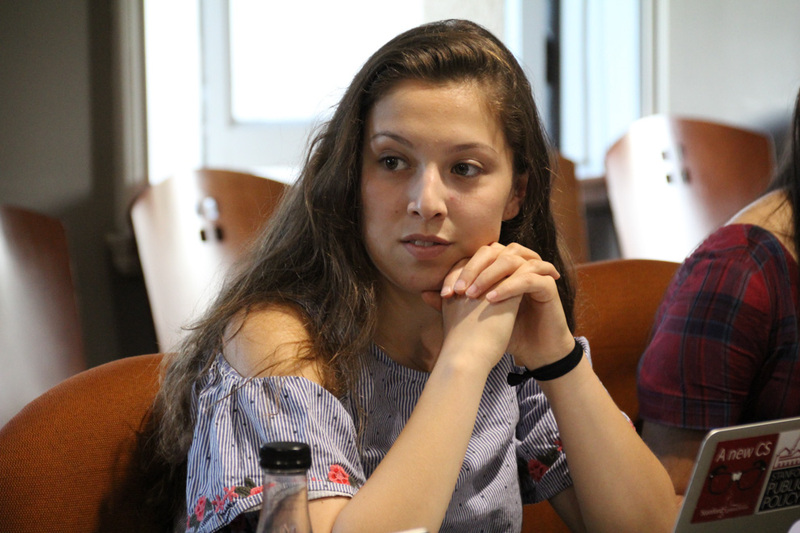 In a 5-0 vote Monday evening, the Constitutional Council unanimously decided that Lizzie Ford ’20 will remain in the Senate, despite assertions made by candidate Jacob Randolph ’19 that he should replace her per an ASSU bylaw on upperclassmen representation among senators. On May 3, Ford was sworn in to replace former senator Matthew Cohen ’18, who resigned when he was appointed chief of staff for the ASSU’s executive branch. Ford, however, is a freshman, and a 2013 Senate bylaw states that at least three elected senators must be upperclassmen. Though Randolph claimed that, as the upperclassman who received the next-highest number of votes in ASSU spring elections, he should have been sworn in over Ford, the Council found that the bylaw applies only in the case of elections, not resignations or other single-seat vacancies. The ASSU’s Constitutional Council voted to keep Lizzie Ford ’20 on the Senate (EDER LOMELI/The Stanford Daily). Randolph did not respond to a request for comment. Stanford Law student and Constitutional Council member Jonathan York ’18 cited the Constitution’s vagueness regarding resignations, saying, “the constitutional amendment could have read, ‘There must be three upperclassmen in the Senate at all times.’” York contrasted the Graduate Student Council’s constitutional setup, which clearly defines district-based representation, and the Undergraduate Senate’s electoral structure, which with the exception of the bylaw does not involve districts, or subsets of the student population. “[The Constitution’s Section Four on the Graduate Student Council] refers to a vacancy as occurring within a district, versus here [in an undergraduate context] we have a much more general provision that refers to a vacancy occurring within the body,” Constitutional council member and Stanford Law student Brian Baran ’18 said. The Council also raised questions regarding the legitimacy of the bylaw itself. The 2013 amendment to establish a rule on upperclass district representation was not ratified by a senatorial two-thirds vote but was instead approved in an election by the undergraduate student body. After the election, ASSU executives did not put the amendment to former Stanford President John Hennessy and the Board of Trustees for final approval, as the Constitution mandates. The Council concluded that, therefore, the amendment was incorporated into the Senate’s bylaws unconstitutionally. Executives Justice Tention ’18 and Vicki Niu ’18 must now put forth the amendment to the Board of Trustees to correct the violation, according to Baran. “Based on our previous deliberations, I think we have tentatively reached the conclusion that even if [the amendment] takes effect upon it being submitted, and even if it had been in effect for this election, the vacancy was still properly filled,” Baran said. The Council’s subsequent vote, which affirmed Ford’s senatorial seat, confirmed that even if the bylaw is legitimate, Ford’s appointment was in accordance with the Constitution and is therefore proper. On or before Thursday, June 1, the Constitutional Council will release its official opinion on the case. Though Baran will personally author the document, the Council will edit and publish it collectively.